Unique design of Serel was deemed worthy of worldwide recognition by receiving Red Dot Award. 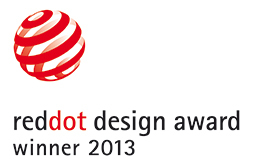 SEREL became our pride in design area in 'Red Dot Design' awards, which is a trip to the future of the world of design. Deemed worthy of award within the scope of “Red Dot Product Design 2013” awards, SEREL achieved a worldwide success. Having taken part in Red Dot Awards 2013, which were distributed with the glorious premiere organized in Aalto Theatre in city of Essen in Germany on July 1, SEREL became the owner of “Red Dot Design Award Winner 2013 with its Amphora Wall Hung water closet design. 1865 designers from 54 countries applied to Red Dot Design Awards this year, which has been organized since 1995. Jury, which is composed of 37 world-renowned experts, assessed 4662 works. SEREL, which made Turkey proud by winning the grand award among such big participation, spiced up the night. Özyeğin University Head of Department of Industrial Design Prof. Dr. Alpay Er, which was among the jury members, was deemed worthy of Honorary Award. Prof. Dr. Alpay Er, who gave a speech in the ceremony, emphasized that Turkey had made a big move in design area. Bringing the amphora form born from the ancient meetings of Anatolia, Mediterranean soil and fire into today's baths with modern lines, SEREL was deemed worthy of the most prestigious design award worldwide with this unique authentic design. Products that received award in the competition, in which 4662 products by 1865 participators from 54 countries were assessed, will be exhibited in Red Dot Design Museum” and web site of the museum for one year. Amphora Series wall hung water closet set, which was designed by SEREL and was deemed worthy of Red Dot award, proves its difference with its quite authentic style at the first glance. It is once more emphasized by the unique design of Amphora Series that the Anatolian society, from which SEREL design group also comes from, can always succeed by using centuries old cultural and intellectual knowledge it has, instead of heading towards foreign sources. Animating a story extending from potter's wheel to today's baths, SEREL Amphora Series was already deemed worthy of award in Design Turkey 2012 design competition organized in our country in previous months. Our story started with the solid resisting to fire. Fury of the fire virtually submitted to the serenity and peace of the soil and they became one heart. While mentioning about bowls, pots and amphoras, the love lasting for years witnessed the history. SEREL Amphora Series brought us the naturality and friendship of the past. This series will sometimes tell the story of food piled in amphoras in ships, sometimes what settled life has given to the mankind; it will be a different story, a different life every time, and will excite his user differently.... SEREL team has collated the traces of the past with his experience of sanitary ceramic, respected the environment and has not ignored the next generations. Great praise to SEREL Amphora in Red Dot web site: Rod Dot competition puts a target, after which all designers and companies run: An idea, which seems impossible, turns into a genius pulse and changes the world. Designers and designer candidates from all around the world present their ideas to an export jury composed of independent and international actors. Red Dot award is important not only in terms of providing motivation to a future design dream and gaining visibility to it. It also turns dreams into reality by helping the participators, who are placed in the centre of the attention of the industry, to find proper co-operations that will turn their ideas into reality. Characteristics of thin and smooth lines used in design of 'SEREL Amphora Series' are that they are ergonomic and practical. To give example from water closet, it provides a water saving of 25% by performing full washing with 4.5 litres of water. In addition to its plug/unplug feature, it maximizes the comfort of use with its slow closing feature; Amphora sink can entirely meet purification and hygiene need with its unique form. Composed of sink, water closet, bidet and urinal, SEREL Amphora series has Clean + and Hygiene + feature; it does not show dirt, is cleaned easily and hygiene reaches maximum rates.